With an average temperature of 75 degrees Fahrenheit, Phoenix allows you to live in warm weather year round. However, as the summer months are approaching, temperatures can reach highs up to 100 degrees! These temperatures can be overwhelming for some, especially if you don’t have a means of cooling off in the heat. Luckily, families in the state of Arizona have combated this problem with the installation of a swimming pool; allowing them time to hop in the cool water and avoid the sweltering heat in the summer months. 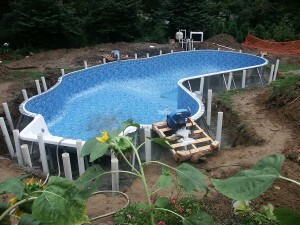 Let’s see the steps a pool builder in Phoenix takes in order to compete your backyard project. The first step for a pool builder in Phoenix is laying out the foundation. A pool builder will measure out and mark off the pool shape in your backyard. Then, the excavation begins. Having a huge dirt hole in your backyard may look scary right now, but in due time, you’ll have a beautiful swimming area for you and your family. Once this foundation is laid out, the pool builder will set up the wall panels and braces, allowing the pool area to really take shape. The next step for a pool builder in Phoenix is laying out and installing all plumbing and electrical equipment. This includes everything, such as piping, pumps, lines for lighting, and water features if desired. If you decide to hold off on special features for your pool until a later date, let your pool builder know. Your pool builder will keep these thoughts in mind, allowing for easy installation of these special features at a later date. The last major step for a pool builder in Phoenix would be creating the pool floor, deck, and vinyl siding. The builder will pour concrete through a bond beam which helps to hold everything in place nice and tight. Then, the pool floor is poured in a precise manner so that the vinyl lining will fit easily. Once this is completed, the pool builder in Phoenix will begin to move the dirt back around the pool, creating a smooth surface between the land, and the body of water. The dirt will also help to cover up braces, beams, and plumbing. It also provides a foundation for which your deck will be built upon. The final part of this process is the installation of the vinyl lining, which snaps into a special track along the coping. A vacuum is then used to remove any excess air between the wall and liner, ensuring that everything is tight and snug. With all of that taken care of, a pool builder in Phoenix can help create a beautiful deck to compliment your pool. There are so many options to choose from, allowing you to find the best match for your pool and backyard. In addition, a pool builder can also assist you with landscaping features, patio furniture, and other backyard accessories that will make your home the place everybody wants to go to. If you’re a resident of the Phoenix area, make sure that you have a pool that can help you cool off from the sweltering heat. A reputable pool builder in Phoenix understands how powerful the Arizona weather can be. They will work with you to create perfect pool area for your Phoenix home.